What is a newspaper reader? This question is enough to cause a lot of angst and hand-wringing from media researchers. In near consensus, research companies around the world have opted to ask the question, "When was the last time before today that you read or look into any issue of (name of newspaper)?" If the answer is yesterday, then the respondent is declared to be a reader; otherwise, the respondent is a non-reader. This particular answer carries two sources of error. First, the issue read yesterday may be many days old. Second, yesterday's issue may be read at some time after the interview. These errors are assumed to be offsetting. Even if they don't cancel each other exactly, it is assumed that their absolute levels are small because, as the Rolling Stones have sung, "Who wants yesterday's paper? Nobody in the world." An even deeper issue is contained in the phrase "read or looked into." The fact is that a newspaper contains many section and pages. Almost nobody would ever read from end to end, looking at every word on every page. Reading is necessarily an incomplete experience. Therefore, the qualifier "looked into" (or sometimes, "glanced at") was added to include partial readers. But how incomplete can it be? Look at the photo below. 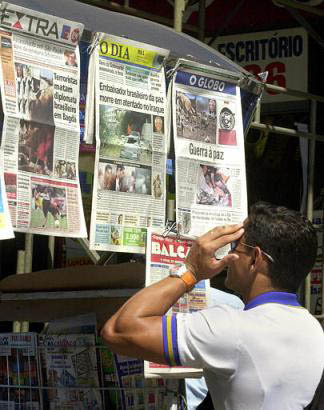 A newsstand has just posted the front pages of the top daily newspaper in Rio de Janeiro. This is an effective 'come-on' sales tool, because the headline stories usually incudes some photos plus a couple of lead paragraphs ending in something like "(continued on Page 3, column 2)". But for an advertiser whose ad appears in the newspaper, the person who only reads the front page will not be exposed to the advertising message. How common is this situation? We will refer to the 2002 TGI Study, in which there are 1,280 persons between the ages of 12 to 64 years old in Rio de Janeiro. 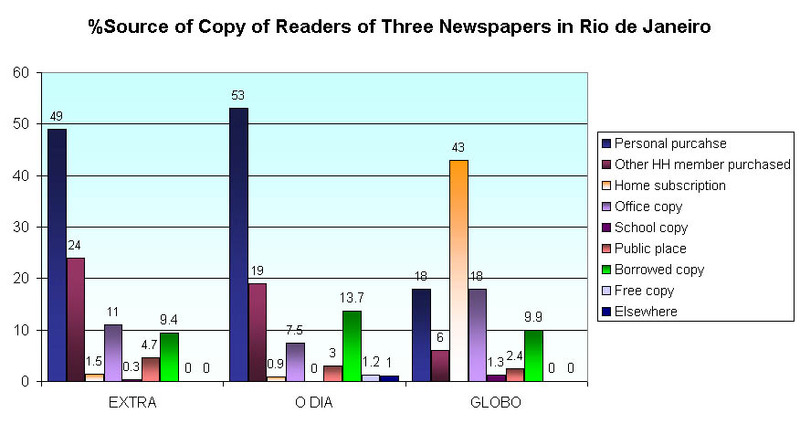 The next chart shows the source of copies among the readers of the three newspapers shown in the photo. For all three newspapers, the incidences of public place reading are less than 5%. Therefore, this is not a serious situation as far as advertisers are concerned.